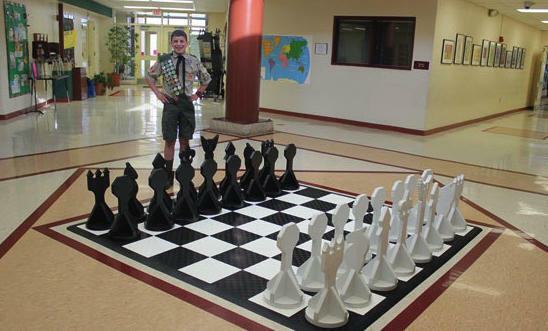 Joshua Becher constructed his own giant chess set, in which each of the pieces are represented by different scouting ranks. On Feb. 27, the Chess Club and Scholastic Center of Saint Louis again hosted a Boy Scout chess merit badge workshop. Since launching the merit badge in 2011, the Chess Club has helped hundreds of scouts achieve their chess merit badge. It hosts a free five-hour weekend chess workshop, where certified instructors teach scouts chess topics, including the basics of the game, intermediate strategy and tactics, and even how to play in a chess tournament. The event offers scouts a unique experience as they have the chance to learn chess fundamentals in the same setting as the U.S. Championships and the prestigious Sinquefield Cup, with the World Chess Hall of Fame across the street. Since 2011, the chess merit badge has been one of the fastest growing of Boy Scout badges, with already over 100,000 scouts having earned the award. Dr. Jeanne Sinquefield, one of the driving forces behind the creation of the badge and a Silver Beaver volunteer on the Great Rivers Boy Scout Council, appreciates that chess is a game that can be played between any pair of scouts no matter where they are. Joshua Becher delivers his chess set. 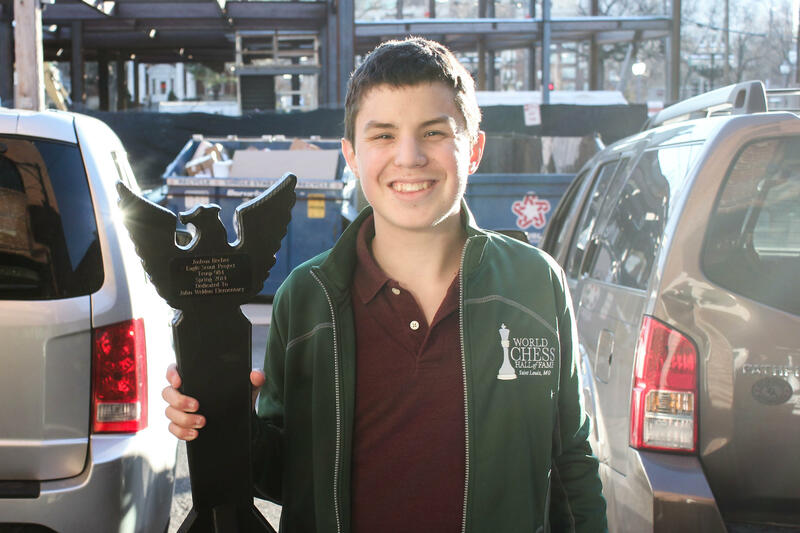 One scout, Joshua Becher, has taken up chess as his Eagle Scout Service Project, a rigorous volunteer project required to achieve the exemplary Eagle rank. Over five months and with the help of more than 20 volunteers, Becher constructed his own giant chess set, in which each of the pieces are represented by different scouting ranks. Becher donated his giant chess set to the World Chess Hall of Fame, which will preserve his hard work for future generations. Future chess merit badge workshop events will be held on April 30 and June 4. Those interested in an upcoming Boy Scout chess merit badge workshop can call the Chess Club and Scholastic Center of Saint Louis at 314-361-2437 or visit saintlouischessclub.org/boyscouts. Adam Gnuse is a scholastic coordinator for the Chess Club and Scholastic Center of Saint Louis, which provides the On Chess articles.